Wedding planning is a tough task and deciding a theme for the wedding is just the beginning of this mammoth job. Secretly all of us think about weddings. Not just our own wedding but also when we are attending one. So where are you headed to this wedding season? Talking about weddings, one cannot miss out on weddings in Delhi. Be it the charms of ChandniChowk where a majority of the shopping happens or the scenic locations like HauzKhas where pre-wedding shoots take place, Delhi is dazzling. In recent years, we have seen a shift from our regular classic band-baaja weddings. Couples prefer various unique and beautiful wedding themes for their special day that makes their wedding unique and special in their own way such that people remember them forever. And trust us, planning a theme for a wedding in Delhi is more than replacing the traditional marigold with plush orchids, because we are so captivated by #Virushka and #DeepVeer. Aren’t we? So here we list a few tips for all those who have wedding planning on their mind. You can choose from a number of wedding themes as per your liking. From ‘Fairy Tale Themed Wedding’ where you can write your own happily-ever-after story to a ‘Green Wedding’, which reflects you as a couple who is sober and closer to nature.And it all matches your budget too. With the right wedding planners, you can have your dream wedding planned in no time. The wedding destination, bride and groom outfits, wedding decorations, menu and everything on your wish list. Basis the trends we have some suggestions for you. Lighter shades are in. Being subtle is the new trend in Indian weddings. Colours like pink, peach, mauve or cream are preferred. However, too much of flowery appearance can be avoided. 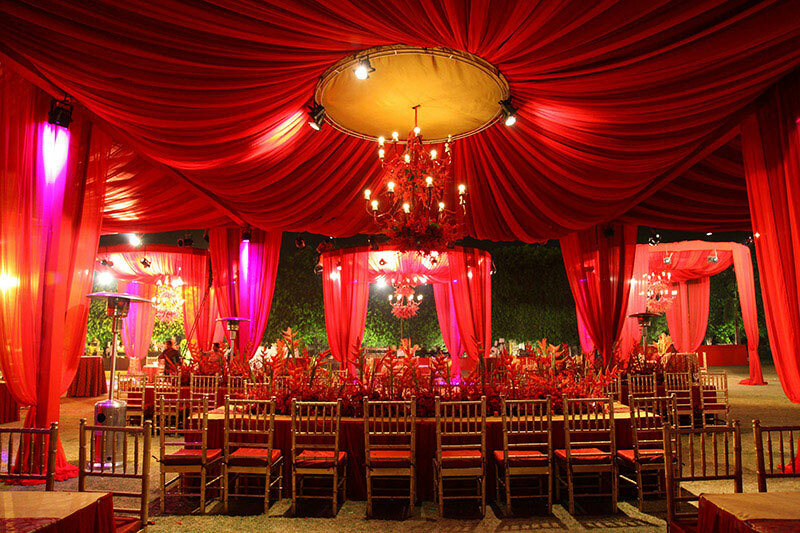 We can always work with duppattas and other draping material for the décor. The bride & groom outfit can be worked out accordingly so that it doesn’t merge with the décor and still be in the theme. What is a wedding without the right lighting arrangement? Here we suggest you use a mix of light sources like rice lights, earthen lamps, candles, and glass reflectors. As the wedding night grows, it makes the ambiance more warm and peaceful. Especially for weddings in Delhi which happen to be mostly in winters, these can do the magic. Controlling food wastage at our weddings. The best way to do is to decide upon a good, unanimously approved menu. The extra food can be given to the needy after the function is over. Being loud is allowed but to an extent. Weddings in Delhi have been always been in news both for good and bad reasons. Undoubtedly we have grand weddings but let us choose more peace-loving wedding themes which aim at eliminating the burning of firecrackers and reduce both air and noise pollution.